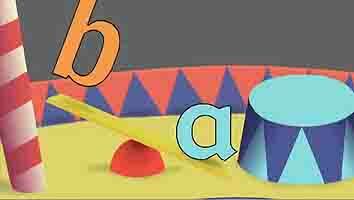 Film A1: You see animated letters perform in the circus ring., and hear the French names of each letter. To help remember the French letter sounds, they are also presented in groups with the same sound: 'beh', seh', 'deh' etc. ...and you hear children spell out their names, like "H-U-G-O". 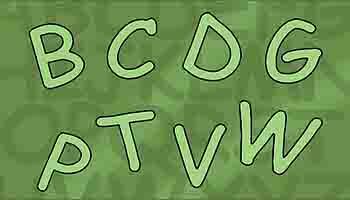 The alphabet is a big help to getting used to French sounds. If learning all 26 letters is too much, why not start by just learning to spell your own name? Play " "SPELL MY NAME": when a child calls their name, you spell it out on the keyboard on-screen, hearing the letters called out as you type. In France, people refer to things by initial letters every day - like 'SNCF' and 'TGV' in the video. French railways have been owned and run by the French government since the 1930's. It has spent lots of French taxpayers' money on making many of the trains fast and modern, whilst keeping the fares quite low. French railway workers often go on strike for more wages - they have more strikes than any other group of workers in France. France is a big country, so the fast trains between big cities are very popular. Many French people also travel by train into the cities to work. But 3 out of 4 French families have a car, and they prefer to drive in their leisure time. There are big traffic jams on French motorways when everyone goes away for their holidays. Suppose you take a cross-Channel ferry from Dover to Calais. Can you plan a trip by train from Calais to the big city of Lille and back again, in one day?